Questions Wanted: What's a Mock Mars Mission Really Like? 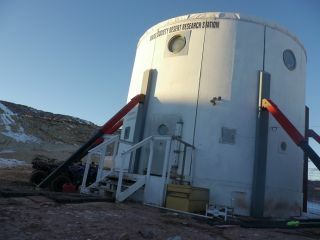 Take a look inside Crew 133's mission (Jan. 4 to 19, 2014) at the Mars Desert Research Station near Hanksville, Utah. In the Utah desert, a team of scientists is hard at work attempting to recreate what a real-life mission to Mars might be like, and SPACE.com contributor Elizabeth Howell is along for the ride to share the experience with SPACE.com readers. So, what questions would YOU want answered about life aboard a mock Mars mission? Elizabeth is part of a team from the University of North Dakota visiting the Mars Society's Mars Desert Research Station near Hanksville, Utah, on a two-week Red Planet simulation. The mission runs from Jan. 4 to Jan. 19 and features a crew of eight commanded by Paula Crock, who has visited the mock Mars habitat simulator before. They will conduct mock "Marswalks" (while wearing spacesuits) and have to work together inside the cramped confines of the habitat module. With six crew members on Crew 133, space was in short supply inside a vehicle heading to the Mars Desert Research Station on Jan. 4, 2014. Pictured is Elizabeth Howell. Have a burning question about the mission or a picture you really would like to see from the site? E-mail contact@elizabethhowell.ca for the chance to get your question answered in a future story.